"I try to capture and share the "Awe" of a place". Working from photos and sketches, Michael combines elements of the area. Starting with a general idea, and keeping with the feeling . It is fun to see how a painting developes. Putting in just enough detail so the viewers eye fills in the rest. Painting is fun and joyous, bringing pleasure to the creator, as well as expanding the imagination and creativity of the viewer. 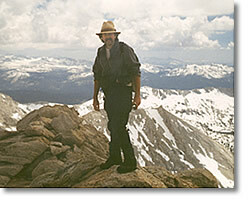 Michael is a native Californian, raised in the Sierra Nevada , near Yosemite National Park. He was encouraged to draw and paint at an early age. Although primarily a “self-taught” artist, he has studied at Sierra College, and taken several workshops from renowned artists. His artistic philosophy has been influenced by his travels to the Far East during a tour with the U.S. Coast Guard in the early 70's and by his nearly thirty years service as wildland firefighter. Michael is currently a full-time artist working primarily in watercolor and acrylic, where he continues to explore the possibilities of the mediums in creating what he refers to as “dreamscapes”, feeling that a painting is “a manmade dream produced for those who are awake”.